When considering naturopathic medical programs, the question of how Naturopathic Doctor (ND) programs compare to MD programs is often asked. Medicine is analogous to a tree: there are many different branches, and each branch possesses its own tools and methodologies. NDs and MDs represent two distinct branches of the medical tree, each sharing the same foundation, or “trunk.” While there are similarities between Western/allopathic medicine programs and naturopathic medical programs, each field is unique and offers distinct benefits to patients and the medical field as a whole. Naturopathic medical training programs are four-year, in-residence, graduate-level medical school programs at accredited naturopathic medicine schools. Four naturopathic medicine schools in the United States (one with two campuses) and two naturopathic medicine schools in Canada are members of the Association of Accredited Naturopathic Medicine Colleges (AANMC), and have been accredited by one of the regional accrediting agencies approved by the U.S. Department of Education. In addition, AANMC member schools’ naturopathic medical programs have been accredited by the Council on Naturopathic Medical Education (CNME), the recognized accreditor for naturopathic medical programs in North America. Like conventional medical schools, naturopathic medical programs require that applicants meet specific pre-requisites. Though the requirements differ slightly from school to school, all AANMC member schools require an undergraduate degree; have minimum GPA requirements; and academic prerequisites, encompassing biology, chemistry, physics, algebra, psychology, social sciences, and humanities. Licensed and licensable Naturopathic Doctors are educated in all the same biomedical sciences as an MD. NDs study holistic and nontoxic approaches to therapy with a strong emphasis on disease prevention and optimizing wellness. Naturopathic medicine students learn to treat all aspects of family health and wellness, from pediatrics to geriatrics. Clinical exposure to patients is essential to the education of Naturopathic Doctors – so much so that clinical training is now being introduced during the first and second years of education at most AANMC-member schools. During the first two years, ND students’ credit loads are very similar to those of MD students. In some cases, as seen below, ND students carry a heavier course load burden than their MD student counterparts. Sources: MD program information: LCME Annual Medical School Questionnaire Part II; 130 schools provided data for 2013-14; no data shown for 2014-15 or 2015-16; AANMC Member Survey 2017; http://admissions.nunm.edu/files/2013/10/2016-17-ND-Curriculum.pdf; http://www.bridgeport.edu/academics/graduate/naturopathic-medicine-nd/curriculum-and-program-requirements/; http://www.scnm.edu/media/3591/4-year-pos-correct.pdf. The early years of naturopathic medical school also include introduction to naturopathic modalities, such as homeopathy, nutrition, and botanical medicine. ND students emerge from the first two years of training with a strong foundation in physiology, pathology, and diagnosis. They use the Western medical sciences as a foundation on which to build a thorough knowledge of holistic, non-toxic therapies, and to develop skills in diagnosis, disease prevention, and wellness optimization. 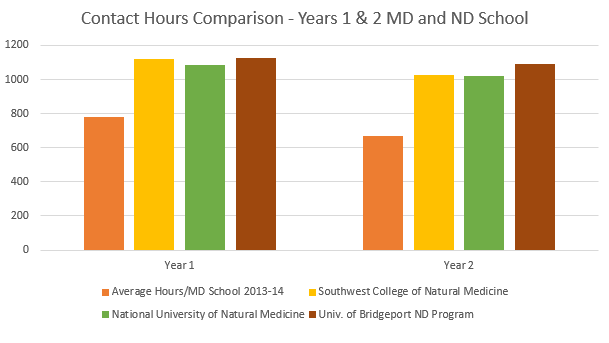 Notably, ND students in U.S. naturopathic medical schools average approximately 150 hours of nutrition training and over 1,330 hours of clinical training. (Source: AANMC Member Survey, 2017). Third and fourth year ND students have increasing opportunities for hands-on clinical training and practice, often at their schools’ teaching clinics and off-site clinics, which offer diverse patient populations. As a result, ND students graduate prepared to begin practice and to diagnose and treat patients in ambulatory settings. All ND students attending AANMC member schools receive over 4,100 contact hours of instruction over four or more years, including a minimum of 1,200 hours of clinical training. NDs’ education teaches them to focus on root cause; their philosophy embraces prevention, a wide range of therapies, the interconnectedness of bodily systems, and the human body’s inherent ability to self-heal, given the proper tools. NDs are primary care physicians trained to be prevention and chronic care specialists. ND students emerge from their programs as experts in preventative care, primary care, and chronic care. If you were unable to find the information you need to determine if a path of Naturopathic Medicine is appropriate for you, please let us know. We would love to help guide you on your journey and ensure you have the necessary knowledge to determine if Naturopathic Medicine is right for you.